I was buying something on Amazon this morning, when I decided to search for “domain name.” I was initially curious to know if I would find any domain name listings on Amazon, but I was very surprised to see how many books about domain names are listed on Amazon. 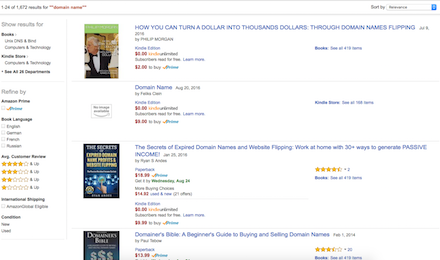 When I did my search this afternoon, Amazon showed 1,672 results for a search for “domain name” and quite a few of the top results include books about buying and re-selling domain names. Many of these books are available in Kindle or other e-reader format so there is no physical book available. I had no idea that there are so many books about the business of domain name investing. What I found very interesting is that I did not recognize the names of many of the authors of the books I saw. I attend the conferences and probably do dozens (or more) Whois lookups every day, and many of the authors are completely unknown to me. This does not mean the information in these books isn’t helpful or valid of course, but I was a bit surprised by the number of books available and lack of recognizable names to me. I’m not surprised that many of the Kindle / eBooks were written by unknowns. That has been a favorite of the get-rich-quite crowd. I’d be more surprised if alot of the physical books were by unknowns. There are also ones written by some famous investors like Kevin Ham, I mean Kevin Hamm. 🙂 Funny how someone uses a famous investors name with a slightly different spelling to try and sell these books. I wouldn’t doubt if some of these books are written by people we know but use a fake author name to not be called out or embarassed about it. A very interesting article, I agree that some have been very good with domains and released books. It’s a very good idea. Sure they can do a little more. Soon after I started in the early 2000’s I picked up a book about the industry at Barnes & Noble in my area. That’s how I learned the history of cool.com, how it had a bid of $8 million in cash plus $30 million in stock, but the guy rejected the offer. No one else seems to know about that.